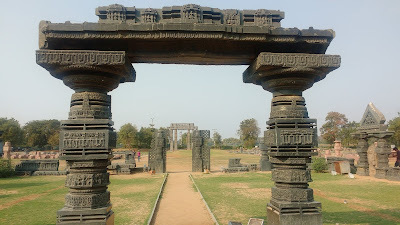 The triple cities of Warangal, Hanamkonda and Kazipet contitute the second largest urban area in the state of Telangana after the capital city Hyderabad. 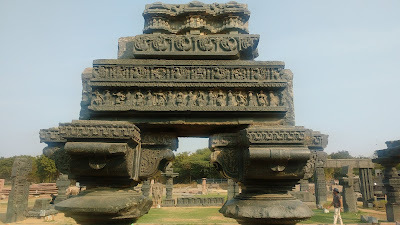 Apart from being an urban centre, the triplets are also culturally important since Warangal was the capital of the Kakatiya Dynasty around the 12th and 13th centuries. 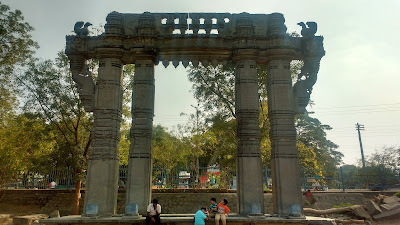 A few monuments from that era dot the urban-scape here; the Thousand Pillared temple and the Kakatiyan Arches being the main ones. 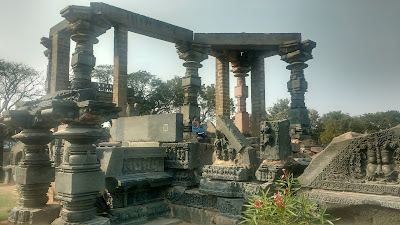 This is perhaps a monument at the heart of the triplets, located as it is at the centre of Hanamkonda. 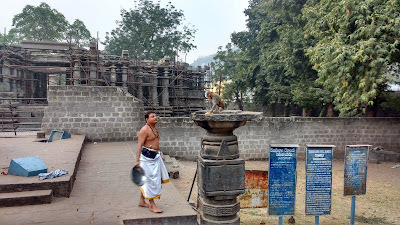 The temple premises are easily reachable from the main road connecting the triplets. The entrance to the complex is from the north. 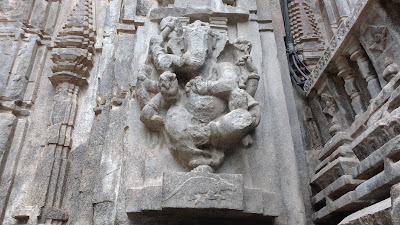 The complex has three sections - the Ramappa Temple to the north and the actual thousand pillared section to the south and a stepped tank to the east. 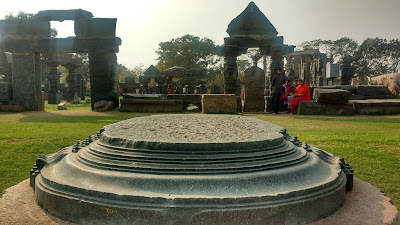 An open Nandi pedestal is between the Ramappa Temple and the thousand pillar section. 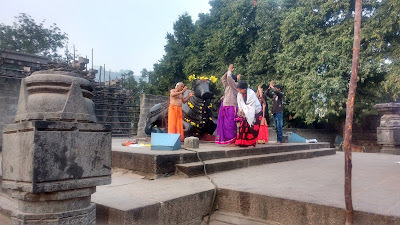 The Ramappa Temple is an active Shiva temple made in ornate black stone (probably basalt). The entrance to the temple is from the south, directly facing the thousand pillars. 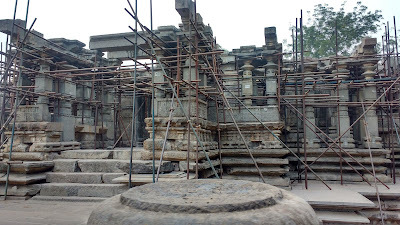 The main draw - the thousand pillars section - has been cordoned off by the ASI for restoration work. 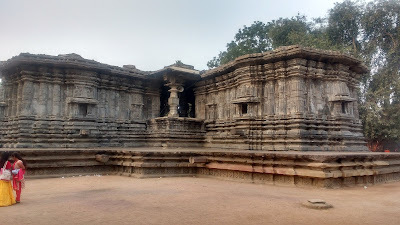 It may have been an extension-mandapa of the main Ramappa Temple. 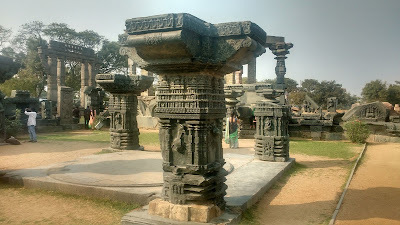 The fort of Warangal, once the capital of the Kakatiyas, lies on a raised hillock to the south of the main city. The fort has expansive walls enclosing a circular periphery with gates in the cardinal directions. The walls enclose the old settlement, the ruined temple and arches, a small lake and a children's park. The ruined temple and the arches are the main draw of the fort. This section is an ASI protected monument. 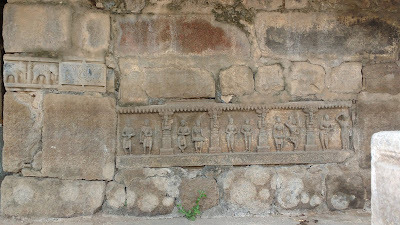 The ASI plaque mentions that the temple was 'swayambhu' - i.e. self-manifested. In any case, one look at the ruins is enough to enthrall even a casual visitor as one understands the sheer size of the structure. 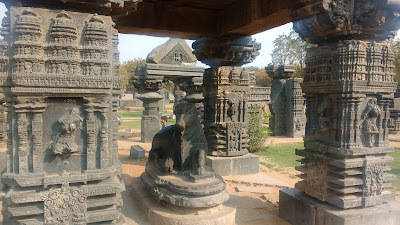 The main temple was destroyed after the fall of the Kakatiya Dynasty to the Delhi Sultanate. The toranams (arches) were considered rather insignificant at that time and thus were left untouched. 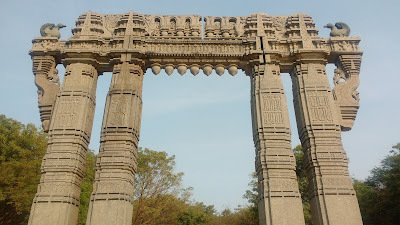 They have now been incorporated as the very symbol of Warangal. There are four arches in the temple complex, each again for the cardinal directions. 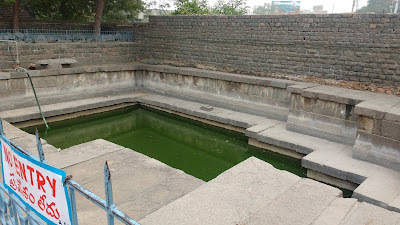 One of the most interesting things in the temple complex is the toilet - built and maintained by ASI, of course. It is an exemplary edifice to the efficiency of the bureaucracy, being located in such a far off corner that a less determined visitor would never make the long walk. Its a full hundred meters further east from the eastern arch and completely obscured by dense vegetation. A little to the west of the temple complex is the Kush Mahal. This is a simple, but tall structure in Indo-Saracenic architecture style. The roof of the structure is accessible by stairs and makes quite a good sunset point. Another sunset point is an old ruined temple located on a high boulder. 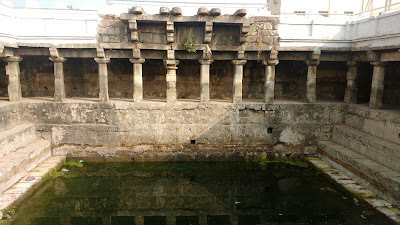 The temple - the highest structure of the fort - faces the lake and is accessible by a path through a children's park maintained by the municipal authority. The Metla Bhavi is located in the middle of a neighbourhood consisting of residences and warehouses, about 15mins walk from the railway station at Warangal. 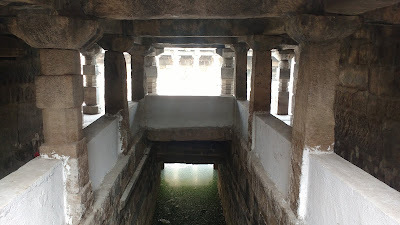 The top layers of the well have been whitewashed. The coloumned ambulatory must've been more ornate earlier than the plain stones that are seen now. The place, as is with many step-wells, needs a bit of cleaning up. The Bhadrakali Lake and its surrounds are supposed to be interesting, but I could not squeeze them in the limited time I had. The triplets have very good biryani places as well as idly-breakfast places. Be sure to check them out. Being an urban hub has its advantages. 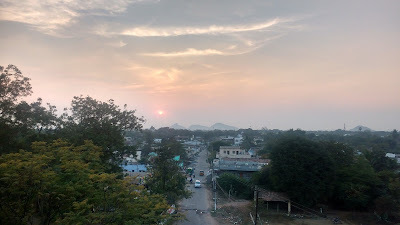 Kazipet is an important railway junction with frequent connections to Hyderabad and other cities in India. Warangal also has a good railway station. A road journey between Hyderabad and Warangal takes about 3 hours. There is a good local bus network between the triplets. The share-autos are reliable as well. 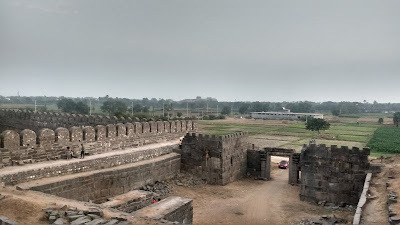 Asking for Warangal fort might get you nowhere - be sure to ask for 'kote', the Telugu word for fort.